Our very first visit to Helen on Friday was an early one, she was awoken with a bouquet of Avalanche Roses together with a lovely message from her groom Alan... We were back later to deliver the bridal bouquets, the gorgeous girls from Pure Beauty were there doing an incredible job of the bridal make up. 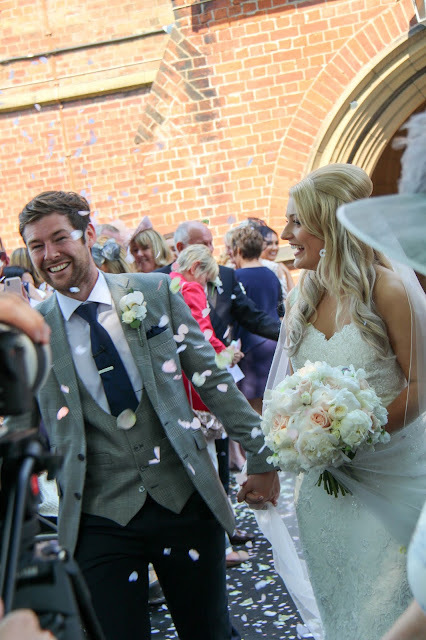 Helen's bouquet was a simple elegant design which captured the classical essence of her and her Pronovias gown. 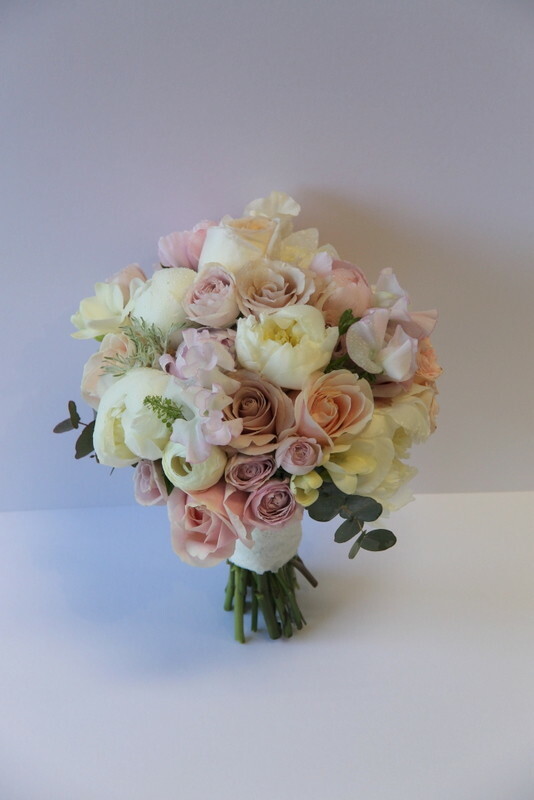 I included some exquisitely fragranced Patience Roses, Jasmine and full blousy white Peonies in the heart of Helen's bridal bouquet. The white Phalaenopsis orchids are undeniably beautiful and innately eyecatching, the perfect cascade for this bridal bouquet. Both the bride's and the maid's bouquets were designed to held "Long" ie the arms to be fully extended, this makes for a linear look that followed the line of the column shaped bridesmaid's gown. The professional photographers for the day are one of our favourites and are on the Flower Design reccommended list, Sarah & Abigail from Abigail and Eye do a great job of capturing all the special moments throughout the day, I love it that Sarah specialises in photographing the girls whilst Abigail looks after the boys. The interior is huge, we made two tall pedestals in a realtively sculptural style with the addition of Cognac Anthuriums to allow for the red carpet. The Church "Flower Ladies" had dressed the altar beautifully with their own fresh flowers. 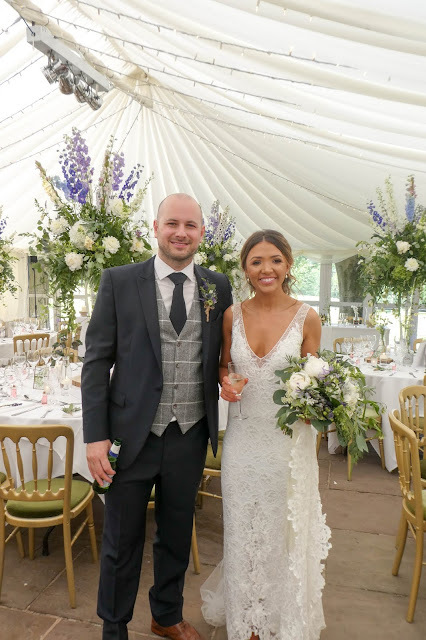 The Groom's Mum Mary had her handbag dressed with Orchids, rolled green rose petals and green Hydrangeas to compliment her outfit in "Bamboo & Black"
The Brides Aunt Jane, had a wrist corsage on a diamante bracelet to go with her white and black outfit. The Gents boutonierre's of Akito Roses and Eryngium thistles. The Groom's Boutonierre of White Phalenopsis Orchid, white rolled rose petals and eryngium. The gorgeous Brides Mum Maureen, Maureen has been an absolute joy to work with throughout the planning and we're going to miss her dreadfully. Maureen's handbag was dressed to co-ordinate with her fantastic outfit. The Bridesmaids Claire, Kate & Sarah looked superb, their gowns were perfect in a pale gold/latte silk. It was a little draughty at St Josephs and the bridesmaids really had their work cut out managing the veil. Father Harry conducted the Ceremony with his own uniqie brand of wit and humour. I decorated the top of the c ake with fresh flowers. Congratulations to Helen & Alan.!! Awesome photography.. Everything is looking sooo beautiful and incredible. I am in love with the flower decoration.